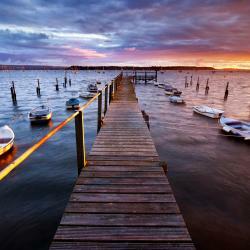 Looking for hotels near Sandbanks? Situated on the Sandbanks Peninsula of Poole Harbour, this elegant hotel features a leisure centre, restaurants and panoramic views of Poole Bay. There is also free WiFi and a beauty spa. With scenic views across Poole Harbour, this hotel offers boutique rooms, an award-winning restaurant and stylish cocktail bar. Poole Ferry Terminal is 15 minutes away by car. Knoll House is a hotel in Studland that boasts a seasonal outdoor swimming pool and tennis court. Some rooms include a sea view and access to a hot tub. Located in Poole, The Plantation offers stylish accommodation with free WiFi access throughout and on-site private parking free of charge. Dating back to 1895, Grovefield Manor offers bed and breakfast accommodation on England’s picturesque south coast. Canford Cliffs and the sandy beaches are only a few minutes’ walk away. RNLI College is located in Poole in the Dorset region, 2 km from Poole Harbour. 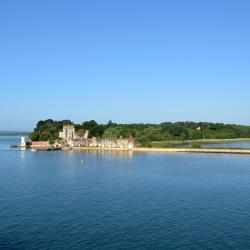 5 km from Sandbanks, the property is also 3.8 km away from Brownsea Island Nature Reserve. It was just an all-round comfortable environment. Located just 5 minutes' walk from East Cliff sandy beaches, on the Bournemouth coastline, Orchid Hotel is just a short distance from the city centre. this is a wonderful hotel, the décor is amazing, so new and fresh. Just a few minutes’ walk from Bournemouth beach, this elegant, award-winning eco-friendly hotel features rooms with hand-made furniture. The restaurant serves food made using local and organic... Staff were very friendly and welcoming which is appreciated after a long journey. With a 24 hour Gym, 24-hour front desk and a bar, the Hampton by Hilton Bournemouth offers free WiFi access throughout the hotel. 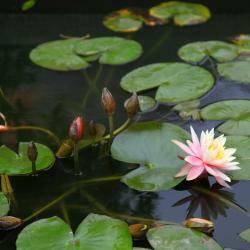 The whole place was bright and clean and very very comfortableThe staff were excellent. A 2-minute walk from the shops and bars of Poole Hill, Cecil Court Hotel offers accommodation in a central Bournemouth location. It has a bar and free parking and Wi-Fi. The staff was extremely friendly and helpful. Just half a mile from Bournemouth Pier, Ramada Encore offers hearty breakfasts, a 24-hour front desk and free internet access. The Pavilion Theatre is just a 10-minute walk away. Breakfast was lovely, excellent choice. Location was great. Boasting a heated indoor swimming pool, sauna and fitness centre, Trouville Hotel offers high quality accommodation close to Bournemouth’s seafront attractions. We have stayed in this hotel on many occasions and absolutely love it. Situated on Bournemouth's West Cliff and offering free parking, Best Western Plus The Connaught Hotel and Spa is only 550 metres from sandy beaches, the BIC, and the Pavilion. The staff at the hotel were delightful, courteous and well trained. Holiday Inn Express Poole is 20 minutes' walk from Poole's ferry port with connections to France and the Channel Islands. Great hotel! Convenient for the ferry, great price, super breakfast! Situated on Poole Quay, this modern hotel overlooks Poole Harbour. Thistle Poole is a family-friendly hotel with 2 bars, a spacious terrace and an award-winning restaurant. Only there overnight. Staff most obliging. Hotels with great access to Sandbanks! Featuring free WiFi throughout the property, The Chocolate Box Hotel offers accommodation in Bournemouth, 200 metres from Bournemouth Beach. Staff,breakfast and chocolate are so good! Very lovely hotel! The Tregonholme Hotel offers a warm and friendly welcome a short walk to the beach. It offers nicely decorated bedrooms, free Wi-Fi in public areas and free parking. Everything was stunning, starting from the staff and ending with the cleanliness. Just 5 minutes’ walk from Bournemouth beach, this boutique hotel has luxury rooms with free Wi-Fi. Fantastic spot. Very comfortable. Great food with lovely staff. I will be back next year. Located close to the centre of Bournemouth, this family-run hotel offers a range of accommodation in a relaxed and friendly atmosphere, perfect for both holiday and business guests. Excellent location for both beaches and shops. This family-run, comfortable AA 2-star hotel is probably the town's friendliest. Very clean rooms with sea view. Staff was very nice and the breakfast was really good as well. The water of Sandbanks Beach is shallow and perfect for paddling! Parents can feel comfortable in the knowledge that lifeguards patrol here the entire summer. Up on the promenade you’ll find a crazy golf course, children’s amusements and a selection of shops and cafés. You’re also able to hire out a beach hut and make use of well-maintained shower facilities. Nice beeches but for us as a family cannot believe why the area is so expensive to live. Old Art Deco buildings look horrible. Restaurants expensive to go with the area. Unsuitable to eat with children due to the cost unless you want fish and chips takeaway. 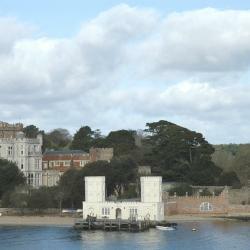 Beautiful view of Brownsea island and the squirrels which live there. Take a drive around the one some way System. Take a drive around the one some way System.Houses are stunning. Take ferry. Can go by car or park up and walk on the ferry. Beach is lovely. Some nice places for a bite to eat. Plenty of car parking. Just driving around the area was fab. Looks like Miami !! Stunningly beautiful part of the UK, absolutely my favourite place to visit. It is fabulous, quaint with an old fashioned air about it, and the locals are really nice even though there are some of the most expensive properties in the country there. Lovely for swimming, fishing etc. There are lovely views across to Studland Bay and beyond. Try the chain ferry and take a ride over to the bay there, great experience. Jazz cafe is a great place for food/drink. Jazz cafe is a great place for food/drink. Catch the chainlink ferry across to Shell Bay. Bucket and spades a must! Great area for windsurfing, kite surfing or paddle boarding, you can park right on the front with all your equipment. My favorite relaxing trip. Take the ferry across the channel for £1 and walk on the great beaches of Studland (but be warned about the "naturist" beach a mile or so down the coast...it caught me off guard. The Haven is a fantastic hotel/resort! People are talking about Sandbanks! Explore guest hotel reviews featuring "Sandbanks"
Spacious suite. Indoor and outdoor pool, hot tub and gymn, games room and lots of common areas in hotel. In a super location for pedestrian ferry to Sandbanks and onward to Brownsea Island. being one of the largest natural harbours in the world, Poole offers varied habitats for migrating birds and its waters shelter a wide range of fish and other sea creatures. Sandbanks and Studland bay mark the beginning of the Jurassic coastline heading west with its varied geology and flora and fauna. The coast walks are a delight with something to see round every corner as well as the wonder of the panoramic views from the high ridges. Go to Sandbanks and drool over the amazing houses overlooking the really beautiful beaches. However, beware parking costs a fortune!